For the next few classes, we will be looking at examples of medieval Welsh poetry and prose. There are separate pages for Medieval Welsh Poetry and for The Welsh Triads ; this page offers a brief introduction to the prose tales collectively referred to as The Mabinogi or (often but incorrectly) as The Mabinogion. 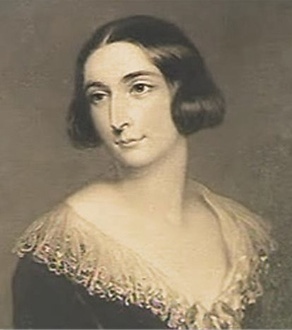 From 1833 to 1849, Lady Charlotte Guest (1812-1895), only daughter of the 9th Earl of Lindsey and wife of the Welsh industrialist Sir Josian John Guest, published her translation of the medieval Welsh prose tales she called The Mabinogion. There are two collections of these tales, one in the White Book of Rhydderch, and the other in the Red Book of Hergest. The White Book is the older manuscript, dating from around 1325, but the only complete text is found in the Red Book, of around 1400. The Red Book is a massive compilation of poetry and prose which includes the text more properly referred to as “The Mabinogi” ; that is, the Four Branches. The error in the name came about as a result of the misunderstanding of the formulae which open and close the tales of Pwyll, Branwen, Math, and Manawydan. Here, for example, is the end of Pwyll in the White Book. The image to the left is found on fol. 10r of NLW MS Peniarth 4, and appears by permission of the National Library of Wales. Click the thumbnail to go to the whole manuscript on the National Library of Wales website. The form here is “mabinogi.” Click the image above to go to a complete digital facsimile of the Red Book of Hergest, at the Early Manuscripts at Oxford project: the section quoted above is on folio 179r. You will also see on that folio that the introduction to the next branch (in red), also uses “mabinogi.” The White Book also uses “mabinogi” for the final formula in another branch. 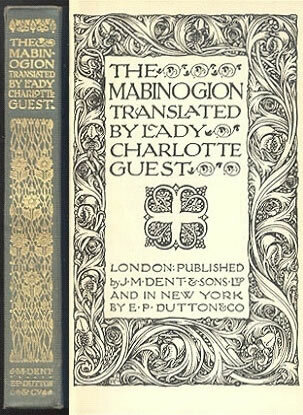 It seems likely, then, that “mabinogion” is a scribal error, but such was the popularity of Lady Charlotte’s translation (see opposite in a 1910 printing) that the name has stuck, as has the practice of presenting an eclectic collection of medieval Welsh prose under this single title. Mab is the Welsh word for son or boy; it has been suggested that a mabinogi might mean something like “a tale of youth.” Nineteenth- and early-twentieth century Welsh scholars saw in the Four Branches the remnants of a mythic hero-tale, arguing that these prose tales, which were felt to have taken something like their manuscript form in the 11th century, preserved much older material – fragments of a complete cycle for the Welsh hero Pryderi, who is born to Pwyll and Rhiannon in the first Branch, and who dies at the hands of Gwydion in the fourth Branch. They pointed to remnants of myth in the names and details of the stories. The name Rhiannon has been traced to Rigantona, a name meaning “great queen goddess.” Pryderi, Rhiannon’s son, may be at root the British god Maponos. The horse-related material in the stories of Rhiannon and Pryderi may suggest the tendency in both Irish and Welsh tales to connect sovereignty with horses and with women. Both Pryderi and the Irish hero Cu Chulain are associated with horses. The importance of the sea is also reflected in this complex of myth – one example is the way that Dylan, son of Aranrhod in the fourth branch, heads to the sea as soon as he is born, and of course Manawydan son of Llyr is the Irish Manannan mac Lir, god of the sea. 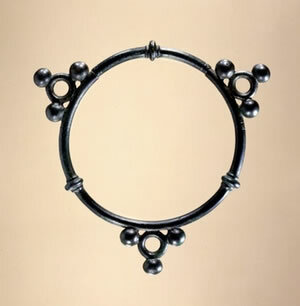 But the Four Branches as they survive to us are not obviously mythic, nor do they present their heroes as gods. Charlotte Guest’s Mabinogion included other contents of the Red Book such as Welsh Arthurian romances: two pages I have created for other courses, The Arthur of the Welsh and Merlin, include more information about some of this material. BBC4 included a documentary about Charlotte Guest in its Great Lives series. Click here to listen to the program on the BBC4 site. As you will also see on the pages devoted to Medieval Welsh Poetry, translation of medieval Welsh allows for a wide range of possibility. In the case of the Four Branches, the habits of translators tend to colour just how ancient these “venerable relics of ancient lore,” to quote Charlotte Guest, sound. 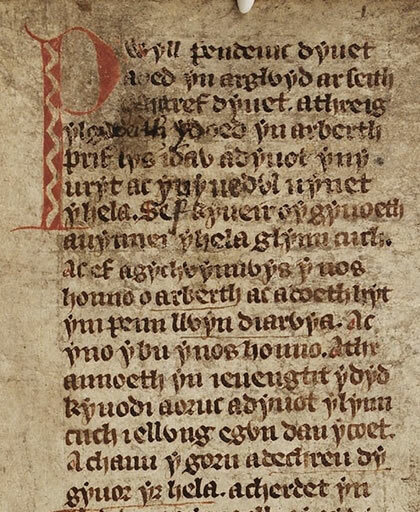 Below you will see the opening of the first branch, Pwyll Pendeuic Dyuet, as it appears in the White Book of Rhydderch, in a modern edition of the medieval Welsh, and in four translations. So that you can compare the edited Welsh with an original manuscript version, I have divided the lines of text to match those in the manuscript. Excerpt from Peniarth MS 4, fol. 1r, appears by permission of the National Library of Wales. Click the image to visit a complete digital facsimile on the National Library of Wales website. a uynnei y hela, Glynn Cuch. Cuch I ellwyng e gwn dan y coet. The challenges facing the translators include the verbal system of Middle Welsh. The “a’s” scattered throughout the Welsh original are verbal complements — so, a oed is our “was,” a dyuot is our “went,” and so on. The sentence that starts “Sef kyueir o’y gyuoeth a uynnei y hela, Glynn Cuch” illustrates another kind of challenge posed by Welsh grammar. Literally, it means “This is the direction of his realm in which he wanted to hunt, Glynn Cuch.” None of the three translators above uses that syntax, but medieval Welsh is full of this kind of construction. The stylistic expectations of medieval Welsh can also prove difficult. An example is the statement that it came into Pwyll’s uryt and uedwl to go hunting. Both of these words can in fact mean the same thing — “mind.” Welsh prose and verse are often elaborately patterned, and decorous repetition is one aspect of that patterning; see the pages on Medieval Welsh Poetry and The Welsh Triads for more about these practices. Here, the translators have to look for two English words that, like the two Welsh words used, mean almost the same thing. Finally, the three translations show differing degrees of conscious archaism. Both the White Book of Rhydderch (National Library of Wales, Peniarth MS 4) and the Red Book of Hergest (Oxford, Jesus College MS 111), and can be viewed online; click the thumbnails above to access the digital facsimiles. Images by permission of the National Library of Wales, and of the Principal and Fellows of Jesus College, Oxford. The Celtic Voices exhibit at the National Library of Wales includes a section on The Mabinogi, with images of Charlotte Guest's diary and her manuscript of her translations. BBC Wales has a history site that includes an article on The Mabinogion. Be sure to click through the links to “next article” here and on subsequent pages: there are actually pages for the White Book, the Red Book, and each of the Four Branches, but it is not particularly clear from the first page that this is the case. The Myths overview page does list all of the articles, but you have to find it first! The American poet Sidney Lanier (1842-1881) produced a version of The Mabinogion aimed at youth in 1881. 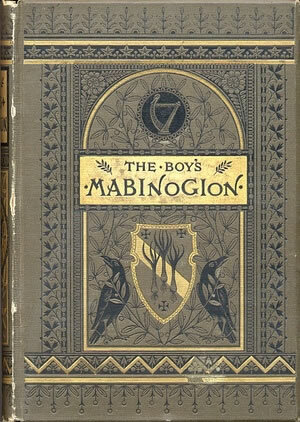 He called it The Boy's Mabinogion (he had already published The Boy's Froissart and The Boy's King Arthur). You can find the whole book, with its illustrations, online at Archive.org; click here to go straight to the book.